The breeding pairs were caught up out of the display aviary at the start of the month and moved down to their breeding aviaries. It took three days to get them all. By the second day they were all wary of the catch-up cage and it took Tristan three days before he summoned up the courage and/or his hunger got the better of him. 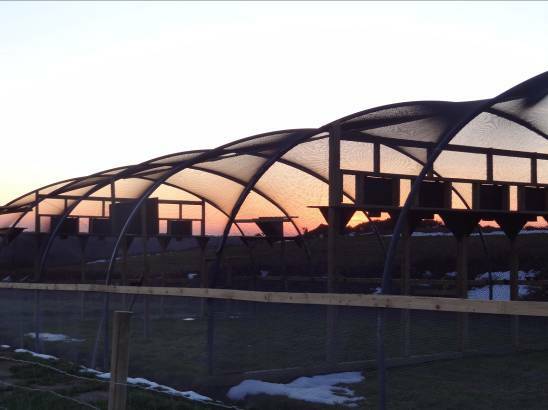 Nesting material was added to the breeding aviaries almost straight away, but the record-breaking snow blizzard deterred the birds from doing anything. As soon as this past and the weather ‘improved’ they began taking the material into the boxes. The choughs in the display aviary braved the elements at the start of the blizzard. 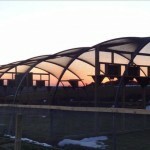 By the end of the first day the snow had settled on the netting and transformed the aviary into an igloo. They were probably warmer than their keepers. Thanks to the generosity of Paradise Park we have been given two brand new Sony 700 line nest cameras. With weather disrupting breeding behaviour we took the opportunity to install one of the new cameras. The existing camera in SF3, whilst showing a clear picture, was not suitable in design, size, and position and was removed. Three juvenile choughs, hatched in 2012, and the trained adult male, George, were scheduled to arrive by plane in Jersey on the 12th March. Lee Durrell had kindly loaned her Navajo plane for the collection of the choughs from Paradise Park. Colin Stevenson was going to be the pilot. However, with the unprecedented snow blizzards this plan was thrown into mild chaos. By hook or by crook the birds had to arrive by the end of that week. If not, the next import date would be in mid-April. Having been ‘snowed in’ for two days at the Wildlife Park, keepers were far from optimistic that the birds would arrive. 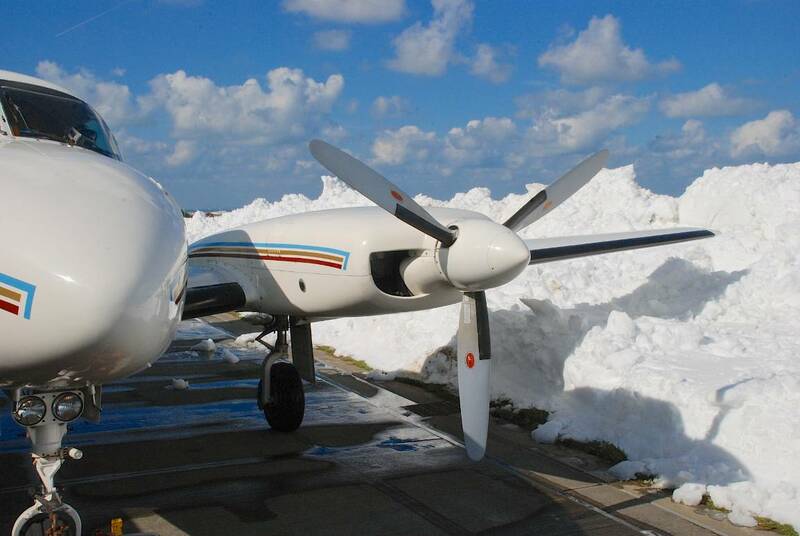 “Steve Driscoll, the Ports of Jersey Group Operations Director and André Rabet, the Airport Engineering Director made a significant intervention by diverting their very stretched crews to clear our taxiway. After, what we were told were near perfect flying conditions, Colin, co-pilot Gregory Guida and the choughs touched down in the early afternoon. 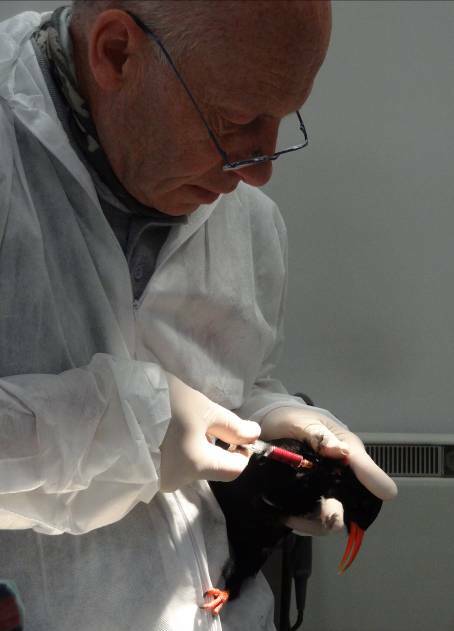 The choughs were accompanied by David Woolcock, Curator at Paradise Park, who had kindly volunteered his time to stay at Durrell for two days to help settle the birds in and discuss training protocols. 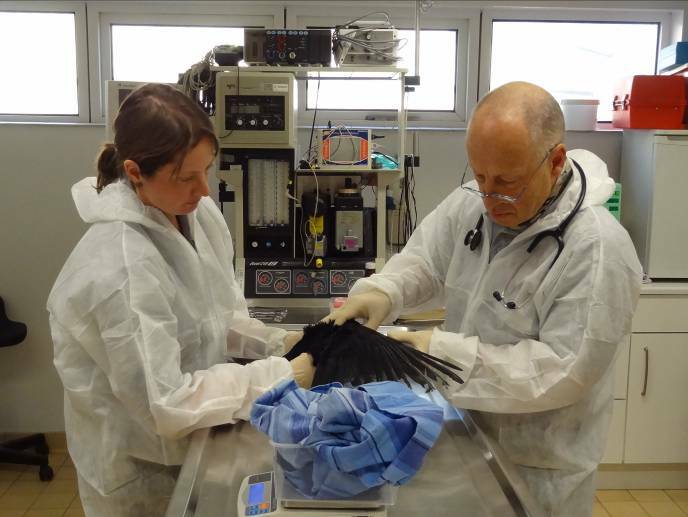 Once the birds arrived at Durrell they were swiftly whisked away to the Vet Centre under quarantine conditions. 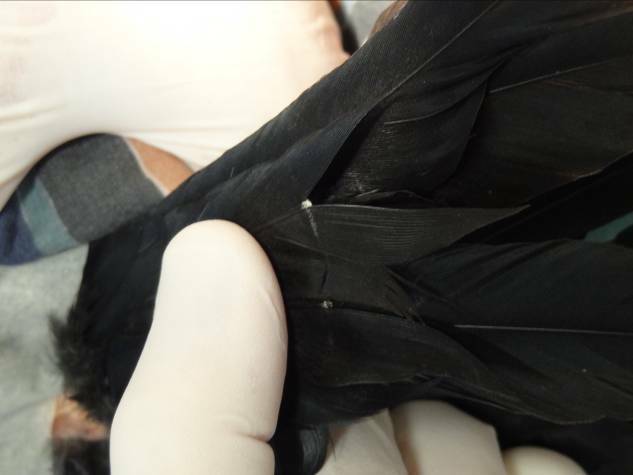 There the birds had a general health check, blood samples taken, ID rings attached, and radio transmitters attached where appropriate. 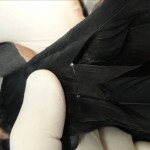 On inspection of two of the juveniles it was noted that some of their tail feathers had ‘fret lines’. The central tail feather, where the radio transmitter is attached, had broken off quite close to the base. It meant it was not possible to attach radio transmitters to these two birds. After careful consideration of the options it was decided that these two would not be used in the trial release. Their feathers will be allowed to moult through naturally at the end of the breeding season and we would consider them for a second release if planned. The two birds involved were still given Jersey addressed metal ID rings in case they accidentally escape over the next few months. It will not make them easier to find but if recovered it will make it easier to identify where they came from. The only one who has not been given a Jersey ring is George due to his leg deformity. 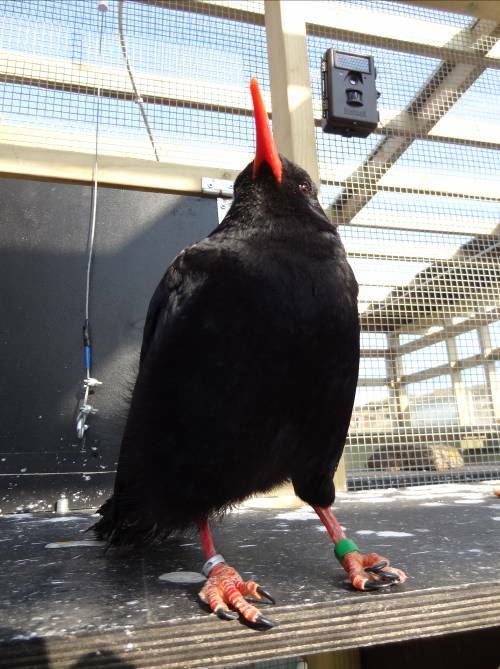 All the choughs at Durrell and now at Sorel have transponders implanted under their skin as another means of identification if recovered. These tiny ‘microchips’ were fitted by Paradise Park staff prior to the birds departure for Jersey. After what must have seemed like a lifetime for the birds they finally got to leave the Durrell Vet Centre and be transported by car to the release aviary at Sorel. Andrew Terry volunteered his time and more importantly his 4WD to transport the birds. Unfortunately the last 100m of track leading up to the field site had not been cleared and the driver faced a 6ft wall of snow. The last leg of the journey had to be done on foot from Sorel car park, but finally with the sun setting the choughs made it to the aviary. They were released into the back half of the enclosure (Sorel1A) where they will stay until the Durrell group get moved up and then mixed together. For the next thirty days quarantine restrictions will apply and only designated staff can access the aviary. The first quarantine faecal sample was submitted to the lab on the 18th. 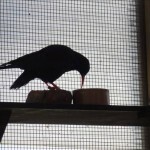 For the choughs (and their keepers) to be ‘released’ from their quarantine period a minimum of three pooled faecal samples need to be taken on a weekly basis. Analysis of these samples will determine whether more are needed and/or if treatment is required. The first faecal sample showed positive for nematodes and coccidians, albeit at low levels. 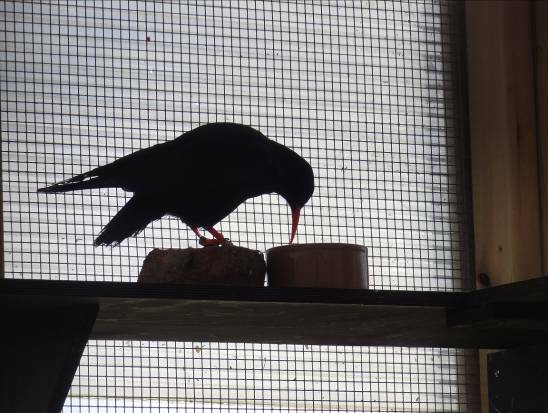 It was decided to not move the Durrell choughs until a second faecal sample could be analysed and a decision made about treatment. 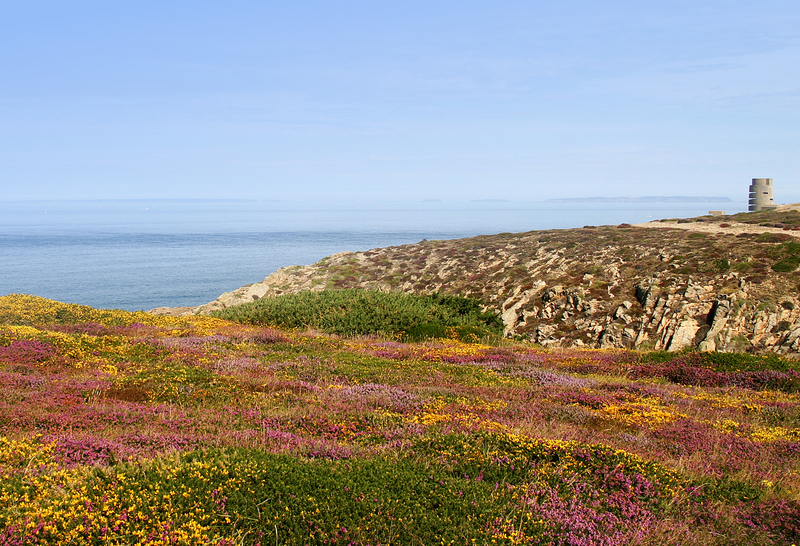 The second faecal showed low levels of coccidians and nematodes, but since this would be typical for wild birds as well it was not deemed significant. However, as a standard of good practice we will treat George’s group with a single injection of Ivermectin (anti-parasitic drug) prior to release. 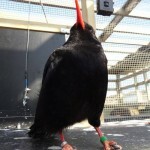 A Bushnell trail camera was installed in the aviary when the choughs moved in. This will act as a security camera as well as documenting the birds’ behaviour when keepers are not present. It has proven very useful so far and we have been able to see how the birds react when dogs, people, and heavy machinery are around. It has shown that like most other corvids, choughs can be active from 05.00 onwards. The camera has also recorded a surprising, and unprovoked, attack on George by the other male in the group. This might be expected since George has been kept separate from the group over the last 5-6 weeks. From the keeper’s point of view, whenever they enter the aviary, the juveniles hide or are too busy eating to show any animosity towards George. Most squabbles seem to be between the juvenile male and the female without the radio transmitter so it was interesting to be able to remotely observe this behaviour. George, having been trained prior to arriving in Jersey, will be the role model for the other choughs when they start their conditional behaviour training. However, it is not a role he can easily jump into. First he needs to adjust to his new surroundings, the new weather conditions (gale force winds are not a common occurrence in Hayle) and, even more challenging, adjust to his new keepers. Whilst George settled in very quickly (eating straight away) it took him a few days to be confident enough to perch close to the keepers. He will now fly to the keeper when called and can jump onto the scales to be weighed. This last task is quite a challenge in his new surroundings. For a start, on certain days he has to battle against the wind. The scales are a slightly different design to what he is used to which will make him insecure. We have ordered the same scales as Paradise Park, but they have to be delivered from the manufacturer in Germany. For the keeper to reach the shelving and be at a comfortable height with George a ladder is required. At first George was scared of the long ladder, so they were swapped for a small pair of steps. Gradually he warmed to the ladder, mainly due to the keeper using it a lot to carry out DIY work inside the aviary. The biggest challenge was in keeper and bird trying to understand each other. George knows the command for “please jump on the scale” and he knows that he will be rewarded with insects. The keeper knows the correct command and the correct reward. But when the bird doesn’t want to jump up in the wind onto a strange object it is very hard for it to convey this. It is a lot easier to hop along to the keeper, look doe-eyed (trust me they can do this) and ‘guilt’ the keeper into giving them insects!